The floor shown in the photos was installed in a dining room. Approximate room size was 12' x 14'. The lumber was 8" - 12" in width and 3/4" thick. Tongue and groove edges were routed on the boards. 6 gallons of epoxy were layered on in 7-8 applications. Epoxy was applied with 3/8" and 1/4" nap rollers. The final finish was not completely smooth like a table top due to cupping in some of the boards. The boards were bonded together because he cut heating vents in and the cut-outs came out as one solid piece and stayed together rather than separating back into the individual boards. The baseboard was also made out of old lumber. The top edge was rounded and then stained so the machined edge would appear weathered. 3-4 coats of epoxy were applied so it is much rougher. 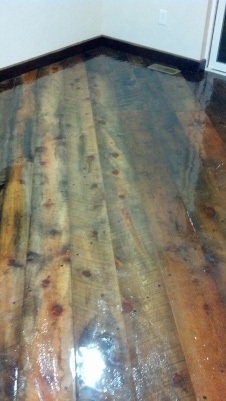 Rough Cut Reclaimed Barn board floor, before clear epoxy coating. Click the picture above to see a larger Version of this picture. 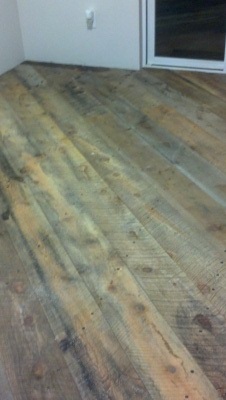 Rough Cut Reclaimed Barn board floor, after clear epoxy coating. Click the picture above to see a larger Version of this picture.